From self-contained solo accordionist to 5 piece or larger band, with vocals in French, Spanish, Portuguese, Italian and English. Music from around the world for background, dancing or concerts. What kind of band are you looking for? One that will cater for everybody’s taste at a comfortable volume? Let me introduce you to just that band. 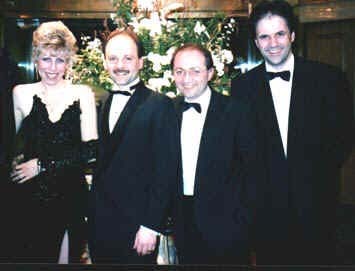 The Claudio Allodi Orchestra in its present format has been together for a number of years. In Claudio, our accordionist and lead instrument, you have the benefit of a totally self-contained solo accordionist who will transport you to France, Russia, Italy, Spain, in fact, anywhere in the world, with his authentic melodies and sounds. By contrast however, once the crowd wants to ‘boogie’ Claudio switches to his up to the minute expander module and you are in no doubt that you are in the twenty-first century! To complement this you have the warm, smooth and stunning voice of Kim, our lead vocalist. Kim sings in French, Spanish, Portuguese, Italian and English of course, and we genuinely believe has the largest repertoire of any vocalist anywhere. However, she is wonderful to listen to – so in the unlikely event your audience do not want to dance, we are confident that they will be more than content simply to listen, enthralled. The rhythm section comprises Emilio on bass guitar and Chris on drums and percussion. In addition, Tony is a competent vocalist, supporting Kim throughout the night with rock and roll, funk and the more masculine touch! Emilio and Claudio provide that special Italian magic with their playing style and close male harmonies, however much of the material is enhanced by wonderful 3-4 part harmonies, meaning we play the songs other bands can only dream about. For your future information, should your function require the bigger sounding band, we have an excellent guitarist/vocalist and optional brass. The Claudio Allodi Orchestra has the very best equipment and is committed to playing at the right volume for the audience and venue. Always punctual, discreet and immaculately turned out, we are simply the band for any and every occasion. When your event is so special, you need total confidence that the music is going to be perfect. The Claudio Allodi Orchestra will not let you down.